If last year's Golden Globe Awards heralded the streaming services' arrival as major television players, this year's list of nominees shows streaming networks have suddenly become the dominant forces. 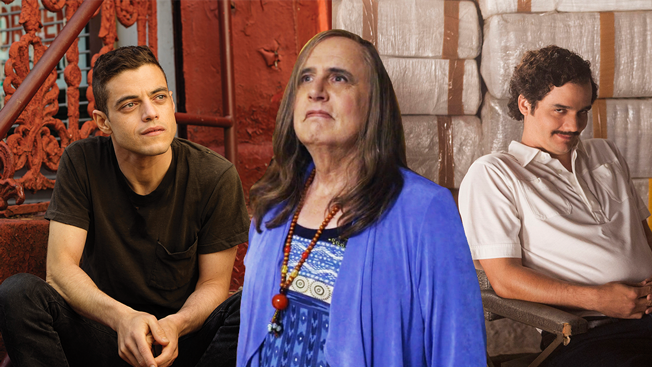 The streaming services accounted for four of the six shows nominated for best TV series, musical or comedy: Casual (Hulu), Mozart in the Jungle (Amazon), Orange is the New Black (Netflix) and last year's winner, Transparent (Amazon). The other two nominees were for HBO shows Silicon Valley and Veep. No broadcast TV series made the list. On the best drama side, a single broadcast show—Fox's Empire—made the cut. It will compete with three cable shows (HBO's Game of Thrones, USA's Mr. Robot and Starz's Outlander) and one Netflix series (Narcos). The stars of broadcast shows barely made a peep. Viola Davis (How to Get Away With Murder) and Taraji P. Henson (Empire) are competing for Best Performance by an Actress in a Television Series – Drama, while The CW got two actresses into the musical or comedy category: Crazy Ex-Girlfriend's Rachel Bloom and Jane the Virgin's Gina Rodriguez, who won last year. In its final year of Globes eligibility, Mad Men was shut out of the drama series competition, though Jon Hamm landed one last nomination as Don Draper. It's his sixth Globes nomination for the role; he won in 2008. Six shows led the pack with three nominations each: American Crime (ABC), Fargo (FX), Mr. Robot, Outlander, Transparent and Wolf Hall (PBS). The TV categories included the Hollywood Foreign Press Association's traditional offbeat mix of big stars (The Grinder's Rob Lowe), shiny new objects (Crazy Ex-Girlfriend's Bloom, Mr. Robot) and headscratchers (Mozart in the Jungle is good, but not that good). Despite the handwringing in Hollywood today over who was nominated and snubbed, in the end, the Golden Globes mean very little to the industry. Many of the HFPA's 90-some members are comprised of freelancers and hangers-on who seem to be easily dazzled by stardom (the Los Angeles Times once called the Globes a "con on the viewing public"). But Hollywood grits its teeth and plays along for one night each year, to throw itself a lavish ceremony, which drew 19.3 million viewers to NBC in January. While the network will enjoy the ratings bump, along with returning host Ricky Gervais, NBC will in essence be airing a three-hour infomercial for its competitors, who elbowed the network out of Globes contention.